Washington, Oct 24 (IANS) The US was considering sanctions against Myanmar, particularly against its military, over the ongoing Rohingya crisis, according to a State Department statement. 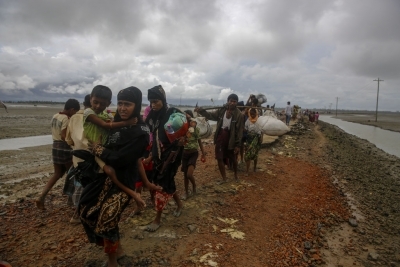 The statement issued on Monday expressed concern over the violence in Myanmar’s Rakhine state that has led to over 600,000 Rohingya Muslims to flee to Bangladesh since August 25, reports Efe news. “We express our gravest concern with recent events in Myanmar’s Rakhine state and the violent, traumatic abuses Rohingya and other communities have endured. “It is imperative that any individuals or entities responsible for atrocities, including non-state actors and vigilantes, be held accountable,” the statement said. In Monday’s statement, the US said it is considering activating the Global Magnitsky Act that includes suspension of visa and other sanctions on those responsible for human rights violations anywhere in the world. Meanwhile, the State Department has already withdrawn US aid to Myanmar military units in Rakhine, suspended visa exemptions of top generals and former members and withdrew invitations to Army commanders to participate in activities in Washington. The US was also “consulting with allies and partners on accountability options at the UN, the UN Human Rights Council, and other appropriate venues”, added the statement. Earlier in 2017 and weeks before he left office, former US President Barack Obama had lifted government sanctions against Myanmar citing substantial improvement in the human rights situation in the country.